Goalball and Beep Baseball are popular competitive sports for those who are blind or visually impaired. There are local, state, national and international leagues associated with both games. There is even a world series for beep baseball! These two sports offer excellent competitive, team-based venues for athletic competition for people who are blind or visually paired. In addition, people of all ages, ability, and level of sight can play together with minor modifications such as the use of blindfolds or night shades. The object of this team sport is to roll a goal ball across the opponents’ goal line. Players attempt to stop the rolled ball. When successful, they quickly return it toward the opposition. Each player has a specific area to cover, moving during play only when attempting to block the ball. Line marking should be used to identify positions. A throw is used to attempt a score by rolling the ball over the opponent’s goal line. A throw is similar to the delivery of a bowling ball. A block is used to stop the ball from going over the goal line. This consists of a side-line position on the floor with arms extended, legs together, and the face protected. A pass is a roll from teammate to teammate. The key is for the teammate to hear the ball but not the opponent. 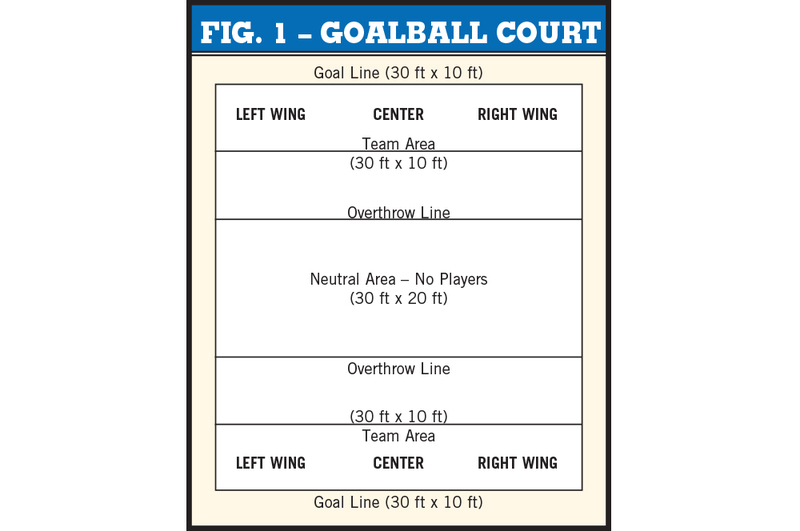 Goal ball can easily be modified to meet the needs of all participants. An official goalball, which weighs approximately three pounds and is made out of a hard rubber, might not be appropriate for everyone. Use a lighter ball such as a beach ball with sand inside. Play from a seated or kneeling position, instead of a standing position. Increase the number of players on each side or decrease the size of the playing court. The object of the game is similar to traditional softball or baseball, only with several modifications. The batter must reach a buzzing base before a fielder has possession of the ball. A team is made up of six people who are blind or visually impaired, and two sighted individuals who serve as pitcher and catcher on offense and spotters on defense. A base is activated when the ball is hit. If the runner reaches the base before a defender successfully picks up and gets control of the ball (fields), a run is scored. Otherwise it is an out. This skill is similar to fielding in softball or baseball. Players use a glove. Securing the ball in the glove is considered a successful field. Throwing to bases for an out is not part of the game. Striking is the same as in softball or baseball. There are only two bases which are in the traditional first and third base positions. Bases are a pylon shape, padded, and emit a noise which lets the runner know with base they should run to. Runners hit the bases with their hands as they go by. Striking a pitched ball is probably the most difficult skill associated with this game. For beginners, follow a similar progression to that in baseball or softball. Allow batters to initially strike off of a batting tee. Fielding practice is also encouraged before attempting to catch a ball that is struck by a batter. • Lieberman, L. J., & Cowart, J., F. (1996). Games for people with sensory impairments: Strategies for including individuals of all ages. Champaign, IL: Human Kinetics.